A leader in nation-wide entertainment, THEY improv now directs their talent to provide quality options to improve the offerings of wineries and tasting rooms around the country. While we reference many of the locations that we serve, the reality is that we can serve any winery or vineyard from sea to shining sea. This includes any wine room, banquet facility, resort or practically anywhere else you might like. Simply contact us to find out how The Grapes of Laugh can come to your venue. Part of the North Coast area of California, Napa Valley has become synonymous with California wine country for most people. In the North Bay area and including Santa Rosa, Sonoma County is a major producer of quality California wines. There are major wineries in Washington State. While California produces much more wine, the wineries here may be more sought after for providing venues for entertainment. While normally thought of as an arid climate, there are many fine wineries. Most are located south and east of Tucson, but there are some in other parts of the state. The Oregon Coast and Columbia River Gorge has long been a major attraction to wine lovers. There are many wineries throughout Upstate New York. Due to seasonal effects, wineries here have long since sought to diversify and thus many companies use these venues for their gatherings. THEY improv is a leader in entertainment for corporate events and private parties as well as having options for team building activities throughout the country. 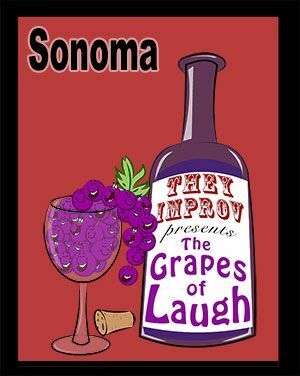 THEY improv now brings these options to wineries and vineyards around the country including in the North Coast of California in Sonoma County and Napa Valley, the Central Coast area including San Luis Obispo County, the South Coast including Ojai, and the Central Valley, as well as in Arizona, Washington State, Oregon, Pennsylvania, and upstate New York as well as to the rest of the country. Simply contact us to find out more about the options that we can bring to entertain your group or improve your venue. This includes working on single events for private clients or for regular public shows that can bring attention and guests to your venue.